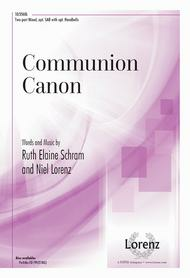 Communion Canon composed by Ruth Elaine Schram. For 2-part mixed choir (SAB) and piano (with optional 2 octave handbells). Sacred Anthem, Holy Communion. Octavo. Published by Exaltation Publications (LO.10-3568L).Blend a charming melody, poignant text and a wonderfully accessible canon, and the result is this refreshing anthem for communion. The optional bells (8 bells total) along with the optional repeat makes this a particularly versatile resource for the worship planner. It works equally well with adult or youth choirs, large or small. 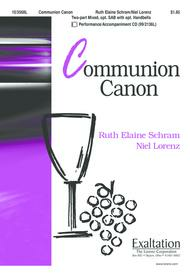 Communion Canon composed by Ruth Elaine Schram. For Two-part mixed choir, Piano, Optional Handbells (2 octaves). Sacred Anthem. Holy Communion. Published by Exaltation Publications (LX.10-3568L).Blend a charming melody, poignant text and a wonderfully accessible canon, and the result is this refreshing anthem for communion. The optional bells (8 bells total) along with the optional repeat makes this a particularly versatile resource for the worship planner. It works equally well with adult or youth choirs, large or small.About Digital Print Sheet MusicDigital Print is printable sheet music available anytime, anywhere. Just purchase, print and play! View your online sheet music at home, school, work or anywhere you have a computer connected to the Internet. Use our iPad app to view your digital sheet music on the go. With Digital Print, you can print your digital sheet music immediately after purchase, or wait until its convenient. And our software installation is easy - we'll guide you through the simple steps to make sure you have Adobe Flash Player, Adobe AIR and the Sheet Music Plus AIR application.